Generation of nuclear fusion reactions with the use of ion beam injection in high pressure magnetic cusp devices is described. The open magnetic field structure of a magnetic cusp allows the use of ion beam injection to generate nuclear fusion reactions. Start-up processes utilizing pulsed high power plasma initiators are employed for rapid generation of high pressure plasma condition inside magnetic cusp devices resulting in increased ion beam confinement. This is followed by energetic ion beam injection from an outer region of the magnetic cusp device into the inner central region via one or more openings of the magnetic cusp. The injected ion beams are confined by the magnetic field in equilibrium with the high pressure plasma and generate fusion reactions when they undergo collisions with the high pressure plasma that acts as a target in the magnetic cusp. This application claims priority to U.S. Provisional Patent Application Serial No. 62/503,758, entitled "Method and Apparatus for Generating Nuclear Fusion Reactions with the Use of Ion Beam Injection in High Pressure Magnetic Cusp Devices," filed May 9, 2017, the content of which is hereby incorporated by reference for all purposes. Embodiments of the present invention relate to methods and apparatuses to generate nuclear fusion reactions in magnetically confined plasma fusion devices with the use of ion beam injection. Molybdenum-99 isotope. If a sufficient neutron flux can be generated by fusion reactions, the neutrons can be utilized to transmutate long-lived transuranic (TRU) wastes generated by conventional nuclear fission reactors. In addition, energetic protons such as 14.7 MeV protons from Deuterium and Helium-3 fusion reactions can be utilized for on-site production of short-lived medical isotopes such as Oxygen-15 and Fluroine-18. While the potential benefits of nuclear fusion are well understood, critical technical challenges remain for generating significant nuclear fusion reactions economically. - A velocity of 7xl05 m/s or higher between the colliding ions. For deuterium ions, this velocity corresponds to a kinetic energy of ions of 10 keV (i.e. lxlO4) eV (electronvolts) or higher. As a result, a fusion device needs a system to accelerate or heat fusion fuel ions to high energies. One method to accelerate or heat fusion fuel ions is to use an ion beam system, where the fuel ions are accelerated to high energies by electric fields from electrical grids. target fuel density of 1x10 m" (i.e. 1x10 cm" ) that is a typical plasma density in magnetically confined fusion devices. As a result, a fusion device needs to confine high energy ions for a long period of time. In prior art embodiments, fusion reactors utilize a high density target made of solid, liquid or high pressure gas to produce significant fusion reactions before the high energy ions leave the device. In order to address the above challenges, several different prior art embodiments of fusion devices have been developed with varying degrees of success. Among them, the use of strong magnetic fields generated by electromagnetic coils has been proven effective to confine high temperature plasma in tokamaks, stellarators, field reversed configurations (FRCs), and magnetic mirrors. In these systems, however, it is not feasible to utilize ion beams to heat fusion fuel ions to high energies. This is because the magnetic field exerts a force to the ion beam and deflects it when the ion beam motion is across (i.e. perpendicular to) the magnetic field line. On the other hand, ion beam can move freely along the magnetic field line as the magnetic field does not exert a force to the ion beam when its motion is along (i.e. parallel to) the magnetic field line. Tokamaks, stellarators, and FRCs all utilize magnetic field structures with closed magnetic field line systems for fuel plasma confinement. In the closed magnetic field line system, there is no magnetic field line connecting from the central plasma region to the outer region. As a result, an ion beam from outside must cross the magnetic field line to enter the central plasma region. Due to the magnetic force on the ion beam, the ion beam cannot penetrate into the central plasma region. Consequently, these devices utilize neutral beam injection (NBI) systems to heat fusion fuel ions. Figure 1 shows an example of neutral beam injection in the Advanced Reactor Innovation and Evaluation Study (ARIES) -III tokamak fusion device, where TF-Coil or Toroidal Field-Coil denotes a set of coils generating magnetic field along the torus, PF-Coil or Poloidal Field-Coil denotes a set of coils generating magnetic field around the D-shaped plasma cross section, Helical Control-Coil is a set of coils generating magnetic field with helical twist to control the plasma equilibrium, Neutral beam Duct is the reactor opening for the Neutron beam Injection, Divertor is where the exhausted plasma from the central region is removed, Divertor Access Port is the reactor opening for Divertor maintenance, Maintenance Access Port is the reactor opening for general reactor maintenance activities, Bucking Cylinder is a steel support cylinder around the torus center to withstand strong magnetic force to the central section of the reactor, Inboard and Outboard Shield is to protect structural materials of the device from high temperature plasma damage, and Vacuum-Duct is the reactor opening for vacuum pumping . In the NBI system, the neutral beams are produced from the ion beams by neutralizing ion beams in a gas target using charge-exchange collisions where ions in the beams acquire electrons from neutral gas in a gas target. Once neutralized, the energetic neutral beams can then penetrate across the closed magnetic field structures of tokamaks, stellarators, and FRCs, as there is no force exerted to the neutral beam by magnetic field when the neutral beam moves across the magnetic field line. Once the energetic neutral beams penetrate the closed magnetic field structure and enter the central region where there is a dense and warm plasma, a majority of neutral beams become ion beams via electron impact ionization and charge exchange collisions. Once converted into ion beams inside the closed magnetic field structures, the ion beams are now confined in the fusion reactors and can generate nuclear fusion reactions from beam-target plasma collisions and beam-beam collisions. In addition, the ion beams can provide heating of plasma to produce thermonuclear fusion reactions in the target plasma. While all major fusion devices based on tokamak, stellarator and FRC technology currently employ the NBI system as one of the main heating systems to generate fusion reactions, the extra steps of charge neutralization and re-ionization reduce the efficiency of the BI system compared to a direct use of the ion beam system if it were feasible. In addition, the use of a gas target for neutralization of ion beams requires an expensive gas handling and pumping system, thus further increasing the cost of producing fusion reactions. "conservation of magnetic moment". In plasma dynamics, the conservation of magnetic moment is closely related to the conservation of angular momentum of charged particles with respect to their gyro-motion around the magnetic field. Due to the conservation of magnetic moment, most of injected ion beams into the magnetic mirror will not be confined by the magnetic fields and will escape the magnetic mirror immediately. Figure 3 shows a computer simulation result for an ion beam trajectory in a magnetic mirror. The mirror magnetic fields are generated by two axisymmetric coils having currents in the same direction and each coil generating 1 Tesla of magnetic field at the center of the coil. The coils have 50 cm of radius and they are separated by 125 cm. The center of the left coil is located at X=150 cm, Y=75 cm, and Z=150 cm, and the center of the right coil is located at X=150 cm, Y=200, and Z=150 cm. A deuterium ion beam with a beam energy of 50 keV is injected from the left side of the magnetic mirror system with the beam velocity direction having an angle of 0.18 rad or 10.3 degrees with respect to the magnetic coil axis. The beam has a width of 10 cm in diameter and the location of the initial beam injection is marked as a gray ring with the beam center at X=150 cm, Y = 12.5 cm, and Z=150 cm. The ion beam spirals around the magnetic field lines as it enters the magnetic mirror from the left traveling to the right. As the ion beam travels through the magnetic mirror, its motion closely follows the magnetic field lines as its magnetic moments are conserved. As a result, the ion beam simply moves out of the magnetic mirror at the other end of the magnetic mirror. The ion beam spends too little time inside the magnetic mirror to generate sufficient fusion reactions. Consequently, magnetic mirror devices also utilize the NBI system instead of ion beams for plasma heating to produce significant fusion reactions. Similarly, prior art embodiments by McGuire utilize the use of NBI system to heat plasma within the magnetic cusp fusion reactor . In comparison, there is a class of magnetic field systems called "magnetic cusp" that are compatible with the use of ion beams to generate fusion reactions. As shown in Figures 4A and 4B, the magnetic cusp systems have magnetic field openings into which ion beams can enter the central plasma region along the field lines. Figure 4A shows the magnetic field lines of the magnetic cusp system generated by two axisymmetric coils having currents in the opposite direction, and Figure 4B shows the magnetic field lines in two dimensions on the cutout plane passing through the center of the coils. Due to the opposing magnetic fields from the cusp coils, the magnetic fields in the central region are weak and the magnetic fields are strong outside of the central region. A key difference between the magnetic cusp and the magnetic mirror is that there is a large central volume where the magnetic field strength is very weak and the magnetic field lines are strongly curved in the magnetic cusp system. In addition, the magnetic field line curvature of the cusp system varies from converging to diverging when viewed from outside to inside. In Figure 4B, letters with a label of "X" are used to mark the locations of the inflection points where the curvature of magnetic field lines changes from converging to diverging. Those inflection points are termed "cusp openings" in this disclosure. Figure 5 shows a computer simulation of ion beam trajectory in a magnetic cusp. Similar to the magnetic mirror case, the ion beam spirals around the magnetic field lines as they enter the magnetic cusp from the left traveling toward the right. However, the ion beam significantly changes its direction of motion as it travels through the central region of the magnetic cusp. In this central region, the radius of ion spiral motion, called gyro-radius, increases with weakening of magnetic field strength. As the gyro-radius becomes comparable to or larger than the distance over which the magnetic fields change field strength and direction, the conservation of magnetic moment no longer applies to the ion beam and the trajectory of ion beam is separated from the magnetic field lines. In the central region, the ion beam motion is largely a straight line since the magnetic field force on the ion is weak. As the ion beam moves outward from the center, the ion beam velocity becomes largely perpendicular to the magnetic field lines and the magnetic fields become strong. As a result, the ion beam is reflected back to the center by the magnetic field and will be confined inside the magnetic cusp system instead of escaping the magnetic cusp. It is noted that if electron beam injection is used instead of ion beam, the injected electron beam will also be confined magnetically inside the magnetic cusp system. This unique property of the magnetic cusp system has been used for synthesis of anti-matter such as anti-hydrogen at the European Organization for Nuclear Research, known as CERN . The research team at CERN developed an electromagnetic trap, known as CUSP, a system to confine injected beams of positrons and antiprotons using two magnetic coils with currents in the opposite direction in conjunction with multiple ring electrodes. In the CUSP trap system, a positron beam of 0.1 eV or less and an antiproton beam of 20 eV or less was injected into a central cylindrical trap volume of 1 cm in diameter and 10 cm in length operating at 2 - 3 Tesla magnetic field at the cusp coil center. In addition, the CUSP trap system utilizes a set of ring electrodes located inside the magnetic cusp coils operating between -250 V and 250 V to control the energy of positrons and antiprotons and to confine them for production of anti-hydrogen atoms. As will be discussed in detail later, the use of ring electrodes is needed in the CUSP trap system because the confinement time of charged beams in the low plasma pressure magnetic cusp system is not very long. Consequently, the CUSP trap system is only effective for a very small number of confined charged particles, on the order of lxlO7 positrons in the trap. This is because the plasma from the confined beam particles can shield external electric fields from the ring electrodes due to its high electrical conductivity, which is known as Debye shielding. The efficiency of the ring electrode system decreases rapidly with increasing plasma density when the Debye length becomes smaller than the size of the confinement system. The estimated Debye shielding length is 0.23 cm for the CUSP trap system operating with a positron density of lxlO6 cm"3 and its temperature of 0. leV. In comparison, the Debye shielding length becomes 0.017 cm for a fusion reactor operating with a 50 keV plasma temperature and a confined plasma density of l . lxlO14 cm"3. Since the efficiency of the electrode system will be greatly reduced for a fusion reactor with a size bigger than the Debye length, embodiments utilizing the prior art CUSP trap system (i.e., the combination of magnetic cusp and ring electrodes) are inefficient in confining injected ion or electron beams to generate significant fusion reactions. Instead, different prior art embodiments are disclosed to confine energetic ions in magnetic cusp systems to generate significant fusion reactions. Bussard disclosed the use of low energy ion injection in combination with electron beam injection, which creates a potential well to confine and heat the injected ions, to generate fusion reactions in the magnetic cusp system . The prior art embodiments by Bussard require the ion beam injection power to be minimal since most of the ion energy is acquired by the negative electrostatic potential well created by the electron beam injection. In addition, an electron beam energy of 10 keV or higher is required to produce a potential well for generating fusion reactions in Bussard' s embodiments. As will be discussed later in detail, the disclosed embodiments by Bussard require a very high electron beam power on the order of lxlO9 W or more to produce electrostatic potential wells due to poor plasma confinement during the initial start-up phase. In contrast, Park et al disclosed the use of one or more specifically designed pulsed high power plasma initiators to generate high plasma pressure or more accurately a high β condition in the magnetic cusp system to improve the plasma confinement during the start up process of the fusion reactor . After the plasma confinement is improved at the high β condition, Park et al utilize electron beam injection with an electron beam energy of 10 keV or higher to accelerate fusion fuel ions within the high beta magnetic cusp reactor via an electrostatic potential well. In addition, the electron beam also provides plasma heating by transferring its energy to the high beta plasma to sustain the high beta condition by compensating for cooling of the plasma. In these embodiments, the use of ion beam injection is not disclosed as only the electron beam injection is utilized to provide fusion fuel ion acceleration and high beta plasma sustainment. As will be discussed later in detail, the minimum required power for an electron beam to produce a potential well to heat fusion fuel ions is high, in excess of 1 MW even for a modest sized fusion device. As a result, it is costly to utilize these embodiments by Park et al for many fusion applications such as neutron generation for radiography applications and production of medical isotopes when the use of modest input power between 1 - 100 kW is desired. It is noted that the plasma beta, β, is defined as the ratio of plasma pressure to the confining magnetic field pressure, β =Ρρια51Μ/(Β2/2μ0), where PpiaSma is the plasma pressure, μ0 is the magnetic permeability, and B is the magnetic field strength. In this disclosure, the beta value of the magnetic cusp devices is determined using the value of plasma pressure equal to an average plasma pressure in the confined plasma volume inside the magnetic cusp and the value of magnetic pressure (Βοη&ν 2/2μ0) with the magnetic field strength at the cusp openings denoted as Bcusp. It is further noted that the plasma pressure is given by 2npkBTp, where np is the plasma density, kB is Boltzmann' s constant and Tp is the plasma temperature by assuming ions and electrons having the same temperature of Tp and approximately the same density of np. In the case of beam type plasma, the average beam energy will be used to determine the plasma pressure, for example, beam plasma pressure = nbeam x Ebeam, where nbeam is the beam plasma density and Ebeam is the average beam energy. If both an electron and ion beam are used, the total beam pressure will be the sum of ion beam pressure and electron beam pressure. This will be analogous to the distinction between static pressure and dynamic pressure in fluid dynamics. It is noted that high beta operation is also advantageous for a compact size economical fusion reactor. This is because the fusion reaction rate scales as β2 if the fusion reactions are produced from the collisions among the ions in the confined plasma excluding injected beam ions. In the case where the fusion reactions are produced from the collisions between the injected beam ions and the ions in the confined target plasma such as in the embodiments of the present invention, the fusion reaction rate scales as β. In this disclosure, a high beta indicates a beta value of 0.2 or above. Other prior embodiments for generating fusion reactions disclosed by Park et al utilize the injection electrons to form a deep potential well and the injection of a neutral beam to control the ion energy in the potential well after formation of the high β plasma in the magnetic cusp system, as shown in Figure 6. The prior art apparatus in Figure 6 comprises a vacuum enclosure (reactor chamber) 101, coils 102 generating cusp magnetic fields within a cusp magnetic confinement region, one or more plasma injectors for high β plasma start up 103, one or more electron beam injectors 104, one or more neutral beam injectors 1201 and a fusion fuel injection system 105 to replenish ions. The vacuum condition is maintained by one or more pumping port 106, gas valve system 107, and vacuum pump system 108. Each coil system 102 is supported by mechanical support structure 109, which includes a power delivery and cooling system 110. As previously discussed, the neutral beam injector is inherently less efficient compared to the ion beam injector as a result of added steps of beam charge neutralization in the beam injector and re-ionization of injected neutral beam in the central region of fusion reactors . Park et al also disclosed a neutron generator utilizing the injection of high energy ion beams on the order of 50 keV into a high density plasma in the magnetic cusp system after the high beta plasma is formed utilizing plasma initiators. Electron injection is utilized to heat the plasma, so as to sustain the high beta condition and its corresponding favorable confinement without producing an electrostatic potential well. In addition, electron injection and ion injection are utilized to heat the plasma to induce fusion reaction and to generate neutrons. While the plasma heating is essential to sustain the high beta condition, the plasma loss rate increases with temperature for a magnetic cusp system operating at high beta, as will be discussed later in detail. As a result, in certain fusion applications, it is advantageous not to heat the plasma to induce significant fusion reactions from the collisions between the ions in the plasma, while generating fusion reactions from the collisions between the injected high energy ion beam and the ions in the plasma. Separately, it is also advantageous in certain fusion applications to produce a low energy electrostatic potential well of much less than the ion beam energy, using a low energy electron beam. Figure 21 shows an apparatus having cusp magnetic fields, one or more plasma initiators, one or more ion beam injectors, one or more electron beam injectors, and one or more fusion fuel injectors in accordance with embodiments of the invention. In accordance with embodiments of the present invention, we describe methods and apparatus that utilize ion beam injection into a high pressure target plasma confined inside cusp magnetic field configurations to generate nuclear fusion reactions. The apparatus in Figure 7 is one of the preferred embodiments of the present invention. It comprises a vacuum enclosure 201 (reactor chamber), coils generating cusp magnetic fields 202, one or more plasma initiators 203 to form high β plasma 204 during the start up, one or more ion beam injectors 205 to produce fusion reactions and to provide heating to the target plasma to sustain high β plasma, and a fusion fuel injection system 206 to replenish ions and electrons in the target plasma. The vacuum condition in the device is maintained by one or more pumping ports 207, a gas valve system 208, and vacuum pump system 209. Each coil system 202 is supported by a mechanical support structure 210, which includes a power delivery and cooling system 211. It is noted that a spherical shape volume for the high β plasma 204 is shown in Figure 7 to outline the high β plasma in the magnetic cusp system. The use of spherical shape volume is to simplify calculations for various estimates given in the disclosure. The preferred embodiments of the present invention cover the following key areas related to generating economical fusion reactions for various fusion applications such as neutron generators, medical isotope production, and transmutation of nuclear wastes. In addition, when high energy charged particles from fusion reactions deposit sufficient energy to sustain the high pressure condition in the magnetic cusp devices, the present invention can be utilized for power generation as a stand-alone fusion reactor or a fusion-fission hybrid reactor. The following are four key technical areas of the present invention. As discussed previously, the use of an ion beam system is advantageous compared to the neutral beam injection systems that are currently used in many magnetic fusion devices. The ion beam system in the present invention may operate with the following specifications. Deuterium (D+), Tritium (T+), Helium 3 isotope (3He+ or 3He2+), and Boron 11 isotope (UB+, UB2+, i iB3+ ^ i iB4+ or i iB5+) In additi on; ions can be in the form of molecules such as H2 , D2 , T2 or DT . These ion beam species can generate fusion reactions when they interact with corresponding target plasmas from the following fusion reactions. b. Ion fraction: Though some of the ions in the ion beam will acquire electrons during the beam generation and beam propagation, thus becoming neutralized, the ion beams will carry at least 75% of the beam power when the ion beam enters the magnetic cusp openings. c. Ion beam energy: The useful ion beam energies are in the range of 10 keV to 700 keV or more preferably ranges of 10 keV - 100 keV, 20 keV - 200 keV, 30 keV - 300 keV, 50 keV - 500 keV, and 100 keV - 700 keV. In these ranges of beam energy the acceleration of ion beams can be achieved using one or more accelerating grids in the ion beam injector with direct current (DC) voltages. As shown in Figure 5, the ion beams can enter the central region of the magnetic cusp system via cusp openings. The magnetic cusp openings are located in the magnetic cusp system where the magnetic field line curvature varies from converging to diverging. Due to the converging curvature of the magnetic fields from outside toward the cusp openings, the ion beams can be injected into the magnetic cusp system in many different configurations. For example, the ion beam injector does not have to be perfectly aligned with the magnetic cusp openings to be efficient. Figures 8A-8C show the simulation results of ion beam trajectories where the beam injection direction is along the axis of the cusp coils but the beam injectors are located away from the axis of magnetic coils resulting in the ion beam injector aligning not directly toward the cusp opening. The cusp magnetic fields are generated by two axisymmetric coils having currents in the opposite direction with each coil generating 1 Tesla of magnetic field strength at the center of the coil. The coils have a radius of 50 cm and they are separated by 125 cm. The center of the left coil is located at X=150 cm, Y=75 cm, and Z=150 cm, and the center of the right coil is located at X=150 cm, Y=200, and Z=150 cm. The magnetic field axis will be along the Y-direction at X=150 cm and Z = 150 cm. A deuterium ion beam with a beam energy of 50 keV is injected from the left side of the magnetic cusp system. The beam has a width of 10 cm in diameter and the beam injector location is marked as a gray ring at X=150 cm, Y = 12.5 cm and Z = 160 cm for Figure 8A, X=150 cm, Y=12.5 cm, and Z= 170 cm for Figure 8B, X=150 cm, Y=12.5 cm and Z= 180 cm for Figure 8C. The offset distance between the magnetic field axis and the ion beam injector is 10 cm or 20% of coil radius in Figure 8 A, 20 cm or 40% of coil radius in Figure 8B, 30 cm or 60% of coil radius in Figure 8C. As shown in Figures 8A and 8B, the injected ion beam will follow the converging magnetic field lines into the cusp opening and efficiently enter the central region of the magnetic cusp system even though the ion beam injector is not aligned directly toward the cusp opening. The converging magnetic field lines of the magnetic cusp system thus allows the use of a relatively wide area on the surface of reactor wall for the ion beam injector location in the embodiments of the present invention. It is however noted that if the beam is directed too far from the cusp opening, the converging magnetic field alone cannot guide the ion beam efficiently toward the cusp openings, as shown in Figure 8C where a significant portion of ion beam velocity is perpendicular to the magnetic field lines and the magnetic force on the ion beam deflects the ion beam away from entering the magnetic cusp opening. Figures 9A-9C show the simulation results of ion beam traj ectories where the beam injection location is on the magnetic coil axis but with the beam velocity direction having angles with respect to the magnetic coil axis. The setup of the simulation is the same as in Figures 8A-8C with two exceptions. The first is that the beam injector is now located on the axis of magnetic coils at X=150 cm, Y=12.5 cm and Z= 150 cm. The second is that the beam direction has angles with respect to the axis of magnetic coils with an angle of 0.09 rad or 5.2 degree in Figure 9A, 0.18 rad or 10.3 degree for Figure 9B, and 0.27 rad or 15.5 degree for Figure 9C. As shown in Figure 9A and 9B, the converging magnetic field can efficiently guide the injected ion beam into the central region of the magnetic cusp system even when the beam direction has substantial angles with respect to the axis of magnetic coils. The converging magnetic field lines of the magnetic cusp system thus allow the use of ion beam with significant beam divergence in the embodiments of present invention. As in the case of beam injector offset, if the beam injection is directed too far off from the cusp opening, the converging magnetic field alone cannot guide the ion beam efficiently toward the cusp openings, as shown in Figure 9C. Figures 10A-10D show the simulation results of ion beam trajectories where the width of the beam injector is increased while the beam injection location is on the magnetic coil axis and the beam velocity direction is also along the magnetic coil axis. The set up of the simulation is the same as in Figures 8A-8C with two exceptions. The first is that the beam injector is now located on the axis of magnetic coils at X=150 cm, Y=12.5 cm and Z= 150 cm. The second is that the width of beam injector is 20 cm in Figure 10A, 30 cm in Figure 10B, 40 cm in Figure IOC, 50 cm in Figure 10D. As shown in Figures 10A, 10B and IOC, the converging magnetic field can efficiently guide the injected ion beam into the central region of the magnetic cusp system even when large beam widths are utilized. The converging magnetic field lines of the magnetic cusp system thus allow the use of ion beam with a wide range of beam width in the embodiments of the present invention. It is however noted that if the beam width is too large resulting in the beam edge to be directed too far off from the cusp opening, the converging magnetic field alone cannot guide the ion beam efficiently toward the cusp openings, as shown in Figure 10D. Once the ion beams are injected into the magnetic cusp system, the injected ions need to stay sufficiently long inside the device to generate significant fusion reactions. In addition, the ions need to maintain their energy sufficiently long to generate significant fusion reactions. These are the two important criteria related to the efficiency of the ion beams for generating fusion reactions. While the open field line structure of the magnetic cusp system allows the injection of ion beams from outside to the central region of the magnetic cusp system, this open field line structure also poses a challenge to confine ion beams and plasma in the central region of the magnetic cusp system. Furthermore, the breakdown of conservation of magnetic moment also contributes to the loss of ion beams or plasma. As a result, the confinement of ion beams and plasma in the magnetic cusp system operating with low pressure or low beta plasma is poor. In contrast, the confinement property of the magnetic cusp system greatly improves when it is operating with high pressure or high beta plasma [5-7]. As a result, one of the key challenges of utilizing magnetic cusp systems for various fusion applications is to produce a high beta plasma and maintain the high beta condition during the operation. Equation 1 provides estimates for electron confinement time for the magnetic cusp system operating at low β (e.g. β between 0 and 0.2) from Park et al . Ax e(Ee,Badiabatic(r-ra(iiaba.ti where radiabatic is the location of minimum magnetic field strength to satisfy the conservation of magnetic moment , pe is the gyroradius of electron having an energy of Ee for a magnetic field strength of B, and A is a numerical constant between 3-6 for a given magnetic field profile. The technical difficulties related to the prior art magnetic cusp fusion systems by Bussard  may be appreciated by examining the needed input electron beam power to produce an electrostatic potential well sufficient to confine ion beam for a fusion reactor using Equation 1 and Equation 2. The confinement time of 10 keV electrons is 1.1 in a magnetic cusp system with a radius of 50 cm and a magnetic field of IT. In order to generate significant fusion reactions, the fusion device needs to operate with a significant fusion fuel ion density. For an average fusion fuel ion density of lxlO13 ions/cm3, a total amount of fusion fuel ions in this magnetic cusp system is 5xl018 fuel ions. Since the total number of electrons needs to be maintained slightly larger than the total number of ions in order to produce the electrostatic potential well, the required electron beam current to maintain the average electron density of lxlO13 electron/cm3 is 730 kA in this magnetic cusp system for the electron confinement time of 1.1 μβ. The required current of 730 kA corresponds to 7.3 GW of electron beam power for an electron beam energy of 10 keV. It is noted that β is only 0.04 for the confined electron beam with a density of lxlO13 electrons/cm3 at 10 keV in the magnetic cusp system of 1 T, which justifies the use of Equation 1 to estimate the electron beam confinement time in low beta condition. Separately, Equation 1 and Equation 2 can also be used to estimate the ion confinement time for the magnetic cusp system operating at low β by replacing the electron energy with the ion energy, the electron velocity with the ion velocity, and the electron gyro-radius with the ion gyro-radius. The estimated confinement time is 5xl0"7 seconds for a deuterium ion beam with a beam energy of 100 keV in a magnetic cusp system with 50 cm of spherical radius and magnetic field strength of IT at the cusp openings, which is not very long. If a target plasma density of 5xl014 cm"3 is used in the magnetic cusp system consisting of 100% tritium ions, the ion beam will generate approximately 3xl0"7 fusion reactions per each injected ion, assuming that the ion will maintain its full beam energy of 100 keV while it is confined in the magnetic cusp system. This corresponds to a fusion reaction rate of 2xl012 fusions per seconds with 100 kW of ion beam input power. Since the ion beam will inevitably lose some of its beam energy as it undergoes collisions in the magnetic cusp system, the fusion reactions per each injection ion will be less than 3xl0"7 fusion reactions per injected ion. This rate of fusion reactions is not sufficiently high to make an economically attractive fusion reactor with the use of ion beams. For embodiments of the present invention, various types of plasma initiators will be utilized during the start up to generate high beta plasma in magnetic cusp fusion systems. A high beta plasma is needed because the efficient confinement of ion beams in the central region of the magnetic cusp system requires a high beta plasma. The technical challenge of plasma initiators stems from very rapid plasma loss during the initial stage when the plasma pressure is low compared to magnetic field pressure. In the case of a magnetic cusp system operating at 1 Tesla magnetic field strength at the cusp openings, the required plasma pressure to reach beta = 1 condition is 3.9 times the atmospheric pressure or 3.98xl05 Pascal. This confined plasma pressure of 2npkBTp is related to the stored energy of the plasma in the magnetic cusp system by the confinement volume as shown in Equation 3.
where Wst0red is the stored energy in the plasma and is proportional to β, RcUSp is the cusp confinement system radius, np is the plasma density, Tp is the plasma temperature, Bcusp is the magnetic field strength at the cusp openings. From Equation 3, it is required to store 208 kJ of energy in the plasma in order to reach β =1 in the magnetic cusp system of 50 cm in radius and 1 T of magnetic field at the cusp openings. For embodiments of the present invention, the plasma initiator will deposit the required stored energy in the magnetic cusp systems based on Equation 3 during short pulse duration with pulse duration comparable to electron and ion confinement time from Equation 1 and Equation 2. By utilizing the short pulse operation, the plasma initiator will increase the plasma beta in the magnetic cusp system toward a desired value before the plasma has time to escape. In order to achieve good ion beam confinement, any substantial β value comparable to 1 may be sufficient to generate the necessary plasma condition in the magnetic cusp system. For example, β may be chosen within the range of 0.2 to 10.0, or may be chosen within the more preferable ranges of O.2-5.0, 0.3-3.0, 0.5-2.0, 0.7-1.5, 0.8-1.2, 0.9-1.1 or most preferably, β may be set to be approximately equal to or equal to 1. Separately, the cusp magnetic field strength at the cusp openings may be in the range of 0.1 - 15 Tesla and more preferably within the range of any one of 0.2 - 10, 0.3 - 8, 0.5 - 5, or 0.8 - 3 Tesla. It is noted that the efficiency of plasma initiators is less than 100% and as such, the required input energy of the plasma initiators is likely to be larger than the stored energy given in Equation 3. In practice, one may choose a plasma initiator (e.g., injector) energy range of 0.5-50 times the value of the stored energy given by Equation 3, or more preferable ranges of 0.5-30, 0.5-10, 1-30, 1-20, 1-10, 5-30, 5-20, and 5-10. The benefit of low temperature plasma for the operation of plasma initiators, compared to high energy electron or ion beam injection is apparent in Equation 1 and Equation 2. This is because the confinement time of injected particles increases with decreases in particle energy. For example, the electron confinement time is approximately 0.12 ms for 50 eV electron energy compared to 0.3 for 50 keV electron energy for the magnetic cusp system with 50 cm of spherical radius and magnetic field strength of IT at the cusp openings. Since the pulse duration of the plasma initiator is related to the confinement time of injected particles, the use of low temperature plasma initiators reduces the required input power of the plasma initiators. As examples of the pulse duration for the plasma initiator of embodiments of the invention, the maximum useful pulse duration may be a multiple of electron confinement time in Equation 1. For example, the maximum pulse duration can be between 0.1 and 20 times the electron confinement time of Equation 1 and more preferably 0.3-3, 0.5-5, 1-3, 3-10, 5-20 times the electron confinement time of Equation 1. The use of Equation 1 is appropriate since the beta starts at 0 initially when there is no plasma and will increase with plasma injection by the plasma initiators during the startup. An optimum pulse duration will be subject to various types of plasma initiators and specific cusp configurations. Although it is possible to use the plasma initiator with a longer pulse than 10 times the electron confinement time of Equation 1, the efficiency of plasma initiator (e.g., injector) will decrease accordingly. In addition, plasma initiators with a shorter pulse duration than 0.1 times the electron confinement time of Equation 1 can be utilized for embodiments of the present invention. For example, the plasma initiator consisting of a wire pinch array (e.g. with 50 individual pinches) can operate with an overall pulse duration approximately equal to the confinement time of Equation 1, while an individual wire pinch can have a much shorter pulse duration. In addition, another plasma injector can be a plasma generated using a short pulse, high power laser. The pulse duration of the high power laser can be very small, compared to the electron confinement time of Equation 1. While the low temperature plasma injectors are preferred over high temperature plasma injectors, there is a minimum electron temperature for the plasma injector in accordance with embodiments of the invention. This is because the underlying physics process that contributes to the improved plasma confinement at high beta is related to plasma diamagnetism [5-7]. In order to utilize plasma diamagnetism, electrons or ions should not undergo collisions that prevent electrons or ions from completing at least one gyro-motion in a given magnetic field. In plasma physics, this condition is called electron or ion magnetization. Equation 4 shows the condition for the electron magnetization. It is noted that the condition for the ion magnetization is more difficult to satisfy than the electron magnetization. For example, the plasma satisfying the ion magnetization will satisfy the electron magnetization but not vice versa. Since the plasma diamagnetism can be produced by electrons without participation of ions, only the electron magnetization condition is utilized in the embodiments of present invention. oce = eB /mec≥A x ve = A x 2.9 x \0'6 ne T;3'2 (4), where coce is electron gyro-frequency, e is electron charge, B is magnetic field strength, me is the electron mass, c is the speed of light, A is a numerical constant between 0.25-5.0 depending on magnetic field configuration and plasma parameters, ve is the electron collision rate, ne is electron density in the cusp confinement system from plasma injection, λ is the Coulomb logarithm (typically ~ 10), and Te is electron temperature. Equation 4 determines the minimum electron inj ection temperature that can be used in accordance with embodiments of the present invention. For example, for the cusp magnetic system with 1 Tesla of magnetic field, the electron gyrofrequency, coce is 1.8xl0u rad/s/. In comparison, the electron collision rate ve of l . lxlO11 collisions/s for β=1 plasma condition at 1 T magnetic field with 10 eV electron temperature and 1.2x10 cm" electron density, thus satisfying criteria given in Equation 4. Equation 4 can also be used to determine the minimum B field needed for embodiments of the present invention. If the B field is too weak, the plasma will be highly collisional and will not produce the diamagnetic effects needed to improve the confinement in the magnetic cusp system. In addition, there is an issue of neutral plasma injection compared to non-neutral single species injection. In general, it is not possible to achieve the high plasma density required to fulfill the high beta condition (i.e. such as β=1) with injection of a single species using an electron beam or an ion beam. As such, embodiments of the present invention employ a scheme that utilizes a neutral plasma injector with approximately equal and large number of electrons and ions simultaneously to create high beta plasma in the magnetic cusp system. Representative and non-limiting examples of plasma initiators that can meet the criteria given in accordance with embodiments of the present invention include: 1) A co-axial or linear plasma injector, 2) plasma injector based on field reversed configuration (FRC) and spheromak, 3) in-situ plasma formation using laser produced plasmas with gas, liquid droplet or solid target, and 4) in-situ plasma formation using high current pinch in a various arrangement. Examples of a pinch system are: 1) a single wire pinch, 2) wire array pinch, 3) pinch using liquid droplet or microparticles, 4) pinch using gas jet, and 5) combination of various pinches. In addition, if multiple pinches are used to form plasma injector, the entire pinch system can operate in a single pulse or series of pulses for each pinch element within an overall pulse duration equal to the electron confinement time given in Equation 1. The plasma initiator can operate with either a gas or solid target of various materials. In general, it is preferred to operate the plasma initiator with plasma forming materials using only the proposed fusion fuels. For example, in the case of D-T fusion fuel, the preferred plasma forming material will be deuterium and or tritium gas, cryogenic liquid or cryogenic solid. However, it is acceptable to use other materials such as hydrocarbons and metals either as mixtures or compound. A co-axial plasma injector, as shown in Figure 11 A, is one of the most common high power compact plasma injectors currently available, consisting of target materials 212, a central cathode 213 and an outer anode 214. Intense electrical currents between a cathode and an anode turn the target materials into a plasma. The key operating principle of the plasma injector for a co-axial or linear geometry is the j x B force from the plasmas current to expel high density plasmas outward (to the right in Figure 11 A) at a rapid speed, based on the invention by Marshall . The plasma injector can operate with either a gas or solid target of various materials. Other plasma injectors could alternatively be used as for example a field reversed configuration (FRC) and spheromaks. These injectors are high power plasma injectors, capable of producing high pressure plasma, with sufficiently high plasma density in excess of lxlO14 cm"3 and plasma temperatures of 50 eV or higher. These operating parameters of FRC and spheromaks are attractive since they can be used to initiate a small to medium size magnetic cusp configuration. It is noted that for a plasma injector (e.g. co-axial plasma injector), FRC or spheromak, one or more additional plasma injectors 215 can be utilized to meet the high beta plasma startup requirement as shown in Figure 1 IB on the off-axis location of the magnetic coil system in addition to the on-axis locations 203. The laser plasma injector is also a suitable plasma system that can be used in embodiments of the present invention as shown in Figures 12A and 12B. In Figures 12A and 12B, a laser target delivery system 216 introduced a small target of solid, liquid or pressurized gas 217 into the chamber. The target is then ionized and heated up to sufficiently high plasma temperature with the use of a high power laser 218 as shown in Figure 12A or multiple high power lasers 218 and 219 as shown in Figure 12B. For multiple lasers, the lasers may have equal or different wavelengths. In 1980, Pechacek and his co-workers at the Naval Research Laboratory had successfully produced β=1 plasmas in an axisymmetric spindle cusp using a combination of a YAG laser and a C02 laser to ionize a solid deuterium pellet in a 1.5 kG gauss cusp field . The lasers produced a plasma with a 15 eV electron temperature and an electron density in the range of 1-I .5xl015 cm"3. With the technology advance associated with laser driven inertial confinement fusion research such as National Ignition Facility at Lawrence Livermore National Laboratory, there are many different types of lasers which can be utilized to produce the initial plasma that has the high density and sufficient temperature, required for embodiments of the invention. A high current pinch is another example of a plasma initiator that can be used in the current invention. The pinch produces a high pressure plasma by flowing a large current through the materials. Figures 13 A through 13H show various configurations of pinches that can be used as plasma initiators where like numbers represent like parts. Electrical energy is stored in the capacitors or batteries 220. The pinch is formed when the switch or switches 221 are activated (closed) and the electrical current is passed through a plasma forming material 222 that is in contact with the electrodes 223. By adjusting the pulse duration of the current, sufficiently high pressure plasma can be produced that meets all the plasma initiator criteria in accordance with embodiments of the invention. Since the plasma stability is governed by the cusp magnetic fields, the stability of pinch is of no concern. As such, one or more pinches can be used to create initial high pressure plasma, since the plasma initiation performance should not degrade if multiple pinches or off-axis placements of pinches are used. Figure 13 A shows a single linear pinch configuration utilizing a solid column or wire of plasma forming materials 222. In Figure 13B, the plasma forming materials 224 can be shaped to improve the pinch operation. The pinch plasma generator has a reaction chamber, the electrodes 223 and a plasma forming material 224 in a tailored configuration having a larger area adjacent to the electrodes and a smaller area in the center of the reaction chamber. By shaping the target materials, the plasma can start in the central region inside the magnetic cusp fields where the current density is highest and the target material thickness is smallest. Once started, the central plasma will expand and accelerate further plasma formation along the solid column. In Figure 13C, more than one column (e.g., wires) of plasma forming materials 225 are used for pinch operation as plasma initiators in order to produce high beta plasma. Each column can be straight or shaped, as for example in Figure 13B, to optimize the plasma initiator operation. In Figure 13D, two or more sets of electrodes 223 are used to form multiple pinches using plasma forming materials 222 and 226 inside the cusp system. Each pinch can have its own energy storage 220 and its own electrical switch 221. They can operate simultaneously or in sequence. If they operate in sequence, the pulse duration of the plasma initiator is measured between the beginning of the 1st pinch and the end of the last pinch. In Figure 13E, multiple columns of plasma forming materials are used for two or more sets of electrodes to form multiple pinches with the multiple plasma forming materials 225 and 227 as plasma initiators. In Figure 13F, a pinch is produced using collimated gas jet 229 from gas injector 228. In Figure 13G, a pinch is produced using either liquid droplets or microscale particulates 231 from the appropriate liquid or particle injector 230. Various combinations of different pinch systems can be used as plasma initiators, as shown in Figure 13H. In accordance with other embodiments, one may combine different types of plasma initiators to achieve the desired high beta conditions within the plasma confinement region. In accordance with some embodiments, any one of the described pinch initiators may be combined with one or more of an injector gun (e.g, co-axial plasma injectors), FRC and laser. Further, one or more of the gun, FRC and laser may be used to provide initial energy to the cusp confinement region and any one of the described pinch initiators may then be used to subsequently augment the energy produced in the confinement region to the required high beta values desired. All of the plasma injectors that are described above are capable of producing a high pressure plasma to meet, for example, β=1 condition during a pulse duration given in Equation 2. It is noted that the list is not meant to be a complete list, as any plasma injector can be used as long as it meets the above criteria. It is further noted that while the term "injector" is utilized herein to describe the various types of plasma devices for forming the plasma, some of these devices do not literally "inject" plasma from the exterior of the plasma chamber (vacuum chamber 201 of Figure 7) to inside the chamber, but rather form the plasma "in situ". The laser device of Figures 12A and 12B is an example in which the high power laser is directed toward the target which is positioned within the vacuum chamber and the target is ionized by the laser to form the plasma within the chamber, i.e., in situ. The current pinch plasma devices of Figure 13A through Figure 13H are further examples of in situ plasma formation wherein the plasma is formed internally to the vacuum chamber and not formed outside the chamber and transported (injected) to the interior of the vacuum chamber. The term injector has been used herein to describe both internally generated and externally generated plasmas. However, to make the term clearer in the appended claims, the term "plasma initiator" (or "initiating" when used as part of a method claim) is utilized to indicate a device or method step that forms a plasma within the vacuum chamber either by in situ formation within the chamber or by transport (injection) of externally formed plasma into the central region of the chamber. Plasma confinement in a magnetic cusp improves greatly if high beta plasma is generated in the magnetic cusp with the use of appropriate plasma initiators [5,7]. This is the first of the two critical roles of high beta plasma in the embodiments of the present invention. In addition to improving the plasma confinement, the high beta plasma also serves as a target plasma for the impinging high energy ion beam to collide and to generate fusion reactions. This is the second of the two critical roles of high beta plasma in the embodiments of present invention. As such we will use the term target plasma interchangeably with the term high beta plasma for the remainder of the disclosure. It is noted that the experimental results from Park et al showed that the improved plasma confinement at high beta can be maintained in a wide range of plasma beta after the initial formation of a high beta plasma . For embodiments of the present invention, the plasma β may be chosen within the range of 0.2 to 10.0, or may be chosen within the more preferable ranges of 0.2-5.0, 0.3-3.0, 0.5-2.0, 0.7-1.5, 0.8-1.2, 0.9-1.1 or most preferably, β may be set to be approximately equal to or equal to 1. This confinement enhancement is caused by diamagnetic currents by electrons or by electrons and ions from the high beta plasma; the equilibrium between the plasma and the magnetic field changes dramatically as shown in Figures 15A and 15B. At low plasma β, the magnetic fields permeate the plasma region in the center. At high plasma β (e.g., β^Ι), the magnetic fields are excluded from the plasma region in the center due to the strong diamagnetic effects of high pressure plasma. Outside the central region there are magnetic fields but no or little plasma, where the magnetic field strength is comparable to the initial magnetic cusp fields by the coils without the presence of the plasma in the central region. As a result, a thin boundary, denoted as a magnetic sheath, is formed at high plasma β where the magnetic fields exhibit a strong gradient, separating the central plasma region from the outer region of the magnetic cusp system. In this disclosure, we will use the term "magnetic sheath" to denote the thin sheath region separating the high beta plasma from the outer region of the magnetic cusp confinement system. As such, the magnetic sheath and the cusp openings constitute the boundary of the high beta plasma or the target plasma in the present invention. The effect of a high beta plasma is then concentrated on the magnetic sheath whose thickness is the size of the gyroradius of the target plasma with its gyro-radius determined by the target plasma temperature. Since the ion beam will have significantly higher energy than the high beta plasma in the magnetic cusp system in the present invention, the thickness of the magnetic sheath will be smaller than the gyro-radius of the ion beam at the boundary. It is noted that some or all embodiments of the present invention utilize a target plasma temperature significantly lower than an ion beam energy, by a factor of 5 or more and a target plasma density significantly higher than an ion beam density in the target plasma, at least by a factor of 25 or more. As an injected ion beam approaches the magnetic sheath from the center to the outer region, the sharp boundary will reflect the beam ion back to the center as shown in Figure 16. When the ion is reflected back to the center in the magnetic sheath, it will make a small excursion on the order of ion gyro-radius during the reflection. This excursion can be toward or away from the cusp openings, depending on the details of its velocity direction. The loss of the ion will occur after many reflections at the magnetic sheath that eventually lead the ion to reach one of the cusp openings. 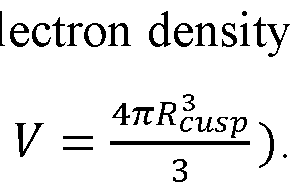 Using classical diffusion theory, we estimate the diffusion coefficient D of injected ion beams as the square of the small excursion distance multiplied by frequency of such excursions, as shown in Equation 5.
where Di-beam is the diffusion coefficient of an ion beam for a high β plasma magnetic cusp system, Pi-beam is the gyroradius of ion beam, RcUSp is the cusp confinement system radius, and Ui-1)eam is the velocity of ion beam. Using the above diffusion coefficient, the confinement time of ion beams can be estimated as shown in Equation 6 by assuming the same magnetic field strength for the magnetic sheath and the magnetic cusp openings. _ ( Rcusp " _ 2Rgusp 10 Rgusp Bcusp Z2 , . confinement time of 0.5 for a low beta plasma condition shown in Equation 1. It is noted that the average ion beam density in the magnetic cusp system as a function of ion beam injection current can be estimated from the ion beam confinement time from Equation 7. Lm(^-3) = 6.25X1018 X ¾Si x I eam (? where ni. eamavg is the average ion beam density in cm"3 and l eam is the ion beam current in Ampere. For a magnetic cusp system with a radius of 50 cm and an ion beam confinement time of 5.5xl0"5 seconds, the average ion beam density is 6.5xl07 cm"3 for 0.1 Ampere of ion beam current or 10 kW of ion beam power at a beam energy of 100 keV. If a target plasma with a plasma temperature of 100 eV is utilized, the β=1 condition yields an average target plasma density of 1.2xl016 cm"3, which is much higher than the beam ion density. At a density of 1.2xl016 cm"3, the high beta plasma also serves as a highly suitable fusion target for the impinging high energy ion beam to collide with and to generate fusion reactions. It is noted that at a target plasma temperature of 100 eV, the fusion fuel ions in the target plasma will not generate any meaningful fusion reactions even though the target plasma density is much higher than the beam ion density. Instead, the fusion reactions will be from the high energy beam ions colliding with low energy target ions forming the high beta plasma. To simplify calculations, we will ignore any fusion reactions from collisions of two high energy beam ions. For a target plasma consisting of 100 % tritium, the deuterium ion beam injection into a high beta magnetic cusp system at β=1 will generate 7.5xl0"4 fusion reactions per each injected ion assuming that the ions will maintain an energy of 100 keV while they are confined in the magnetic cusp system. This corresponds to a fusion reaction rate of 4.7xl014 D-T fusions per seconds with 10 kW of ion beam input power. This rate of fusion reactions is significantly better than the current state of the art D-T fusion neutron generator which produces between lxlO13 and 5xl013 D-T fusions per seconds with 15 kW of ion beam input power using a 300 keV Deuterium ion beam. It is also possible to increase the ion beam confinement time and thus increase the fusion reaction rate by increasing the magnetic field strength and the size of magnetic cusp system, as shown in Equation 6. For example, the ion beam confinement time will increase by a factor of 9 if the magnetic field strength is increased by a factor of 3 based on Equation 6. However, the ion beam will inevitably lose some of its beam energy as it undergoes collisions with the target plasma in the magnetic cusp system. As the ion beam loses its energy, the probability of fusion reactions decreases for a beam energy below 100 keV for D-T fusion reactions, resulting in lower fusion rate. Here we estimate how rapidly the ion will lose its energy to the target plasma. From the Naval Research Laboratory Plasma Formulary , Equation 8 below shows the rate of ion beam slowing in the plasma. UL 'β L i-beam where Ei-beam is the ion beam energy in the target plasma, Vi. eamSlow is the rate of ion beam energy loss to the target plasma (also known as ion beam slowing down rate), ne is the electron density of the target plasma, λιε is the Coulomb logarithm of the target plasma and its value is approximately 10, Z is the charge of the ion beam, μ is the atomic mass of the ion beam, Te is the electron temperature of the target plasma and Ti. eamSlow is the ion beam energy loss time (also known as ion beam slowing down time). It is noted that Equation 8 assumes that the target plasma is at sufficiently high temperature that the electrons in the target plasma will have on average higher kinetic velocity than the injected ion beam due to the smaller mass of electrons. For example, the velocity of the target plasma electrons is 4.2xl08 cm/s for a target plasma temperature of 100 eV, compared to the deuterium ion beam velocity of 2.2xl08 cm/s at 100 keV beam energy. It is also noted that the ion beam energy loss to the ions in the target plasma is much smaller than the energy loss to the electrons, thus ignored in Equation 8. As shown in Equation 8, the injected ion beam will lose its energy to the target plasma via collisions with electrons. Using Equation 4, the ion beam energy loss rate can be estimated at 1.0x105 sec"1 or the corresponding ion beam energy loss time of 1.OxlO"5 s for a target plasma temperature of 100 eV and a target plasma density of 1.2xl016 cm"3 for 100 keV Deuterium ion beam. Since the ion beam energy loss time of 1.OxlO"5 s is shorter than the ion beam confinement time of 5.5xl0"5 seconds, the ion beam will lose a significant fraction of its energy to the target plasma before leaving the magnetic cusp system. In terms of efficiently generating fusion reactions, it is desirable to control the ion beam energy loss time by varying the target plasma temperature using Equation 8. If a very low target plasma temperature is used, the ion beam energy loss time will be much shorter than the ion beam confinement time. In this case, the injected ion beams will lose their energy too rapidly and will not produce significant fusion reactions, though their confinement is good. From Equation 8, an ion beam will lose 63% of injected energy within the ion beams energy loss time, 86% of injected energy within two times the ion beam energy loss time, and 95% of injected energy within three times of the ion beam energy loss time. As such, there will be very few fusion reactions by the ion beam once it loses too much of its injected energy since the fusion reaction rate decreases very rapidly below 10 keV. In fact, rapid ion beam energy loss is one of the main problems for conventional solid or gas target neutron generators, where the use of a very low temperature target limits the efficiency of fusion generation. On the other hand, if a too high target plasma temperature is used, the ion beam energy loss time is much longer than the ion beam confinement time and the ion beam will leave the magnetic cusp system without losing much of its energy via collisions with the target plasma To optimize conditions for production of fusion reactions, embodiments of the present invention will utilize a temperature of the target plasma in the range of 20 eV -20 keV, or more preferably in a range selected from one of 20-200 eV, 40- 400 eV, 100 eV- 1 keV, 500 eV-5 keV, 1 keV-10 keV, and 2keV-20 keV, while the target plasma temperature will be significantly lower than the ion beam injection energy by a factor of 5 or more. Since the collision processes are the underlying mechanisms for both fusion reactions and ion energy loss, it is also desirable to control the rate of ion energy loss comparable to ion beam confinement time. The embodiments of the present invention will thus utilize various apparatus and methods to control the reactor parameters to achieve an ion beam energy loss time in the range of 0.05 - 20 of the ion beam confinement time based on Equation 6 and Equation 8, or more preferably in a range selected from one of 0.1-10, 0.2- 8, 0.3 -5, and 0.4 - 3 for a ratio of ion beam energy loss time divided by ion beam confinement time. Equations 5 and 6, by replacing the ion gyro-radius with the electron gyro-radius and the ion beam velocity with the electron beam velocity, can also be used to estimate the required electron beam input power to produce an electrostatic potential well after plasma initiators produce the high beta condition in the magnetic cusp system and the high beta condition is sustained by subsequent plasma heating. Here we evaluate a magnetic cusp system with a radius of 50 cm and cusp magnetic field of IT operating with 10 keV electron beam injection to produce the potential well. This case represents embodiments by Park et al operating with electron beam injection to accelerate fuel ions via potential well without the use of ion beam. In order to produce the beta = 1 condition, the high beta plasma will require beam electron density of 2.5xl014 cm"3 and beam kinetic energy of 10 keV at the magnetic sheath where the plasma pressure is balanced by the magnetic field pressure. In this case, we assume that the β=1 condition is achieved solely by electron beam pressure at the magnetic sheath. This is because the electrostatic potential well accelerates ions to high energy as the ions move toward the center and decelerates ions to low energy as the ions move toward the magnetic sheath. As the ions decelerate toward the sheath boundary, they no longer generate significant pressure to contribute to the plasma beta at the magnetic sheath. It is also noted that while there may be additional electrons at low energy in the magnetic cusp system, the low energy electrons do not contribute much to the plasma pressure. Using the value of 2.5xl014 cm"3 as an average beam electron density in the magnetic cusp system, the total number of beam electrons is 1.3xl020 electrons. Since the confinement time for 10 keV beam electron is 0.1 second from Equation 6 using a beam electron velocity of 4.2xl09 cm/s and a gyroradius of 2.4xl0"2 cm, the required electron beam current to sustain the average electron beam density of 2.5xl014 cm"3 is 210A. It is noted that this required electron beam current is significantly less compared to the case operating at low beta. However, this current is still high as it corresponds to 2.1MW of electron beam input power at 10 keV electron beam energy. While a lower energy electrostatic potential can be formed with a less electron beam power, the ion in the potential well does not gain sufficient energy to produce significant fusion reactions if the potential well becomes less than 10 keV. Consequently, the embodiments by Park et al operating with electron beam injection to accelerate fuel ions via potential well will not produce significant fusion reactions unless a substantial electron beam power on the order of 2.1 MW or more is employed. The use of ion beams in the present invention bypasses the need to produce a potential well since the ion beam acquires needed energy from the electrical grids located inside ion beam injectors and not from the potential well in the magnetic cusp system. As a result, the embodiments of present invention can produce fusion reactions in the range of lxlO11 fusions/s to lxlO17 fusions/s with significantly less input power than the one required to operate the embodiments by Park et al of using electron beam injection and the deep potential well for fuel ion acceleration. A useful feature of the diffusion loss of ion beams in the high beta magnetic cusp system as described in Equation 5 and Equation 6 is that the ion beam diffuses along the magnetic sheath region separating the central high pressure plasma region from the outer vacuum region and eventually escapes the high beta magnetic cusp system via one of the cusp openings. In addition, the high beta target plasma is also confined inside the magnetic sheath region. Additional embodiments of the present invention thus utilize reactor chambers having sufficient clearance from the magnetic sheath and the magnetic cusp openings so as not to intercept the plasma and ion beam motion in the high β plasma region of the magnetic cusp system. The spatial clearance between the reactor chamber and the magnetic sheath will be set at least 10 times the gyro-radius of the ion beam in the magnetic sheath. The reactor chamber will have a similar clearance from the cusp openings. By configuring the vacuum enclosure not to intercept the plasma and the beam motion, the embodiments of present invention utilize the cusp coils located outside the reactor chamber to generate magnetic cusp fields, as shown in Figures 17A-17C. The apparatus in Figure 17A is another embodiment of the present invention. It comprises a vacuum enclosure or reactor chamber 301 (shown with a thick line) having sufficient clearance from the magnetic sheath 312 (shown with thick dotted lines) and the magnetic cusp openings 313 and 6 coils 302 in a hexahedral configuration outside the reactor chamber 301. Dotted lines 314 denote the magnetic field lines close to the magnetic sheath 312 and letters X denote the magnetic cusp openings 313. It is noted that like numbers represent the like parts such as one or more plasma initiators 203 to form high β plasma 204 during the startup and one or more ion beam injectors 205 to produce fusion reactions and to provide heating to the target plasma, and a fusion fuel injection system 206 to replenish ions and electrons in the target plasma. The apparatus in Figure 17B is another embodiment of the present invention. It comprises two axisymmetric cylindrical coils 402 outside the reactor chamber 301 with the reactor chamber 301 having sufficient clearance from the magnetic sheath 312 and the magnetic cusp openings 313. It is noted that other components such as plasma initiators, ion beam injectors, fusion fuel injector system, pumping ports, valves and pumps are omitted for clarity. It is also possible to construct an N-coil system cylindrical cusp system using N number of coils with N being 3 or larger. The embodiment of 3-coil cylindrical cusp system using external coils is shown in Figure 17C having cylindrical 3 coils 502 outside the reactor chamber 301. The use of external magnetic coils will simplify installation, cooling and maintenance of magnetic coils. As discussed previously, one of the main functions for the target plasma is to maintain the high beta equilibrium in the magnetic cusp system for efficient ion beam confinement; this requires plasma heating and fueling to compensate for cooling and loss of the target plasma. As previously discussed, favorable confinement by the magnetic cusp system can be achieved over a wide range of plasma beta. As such, the beta of the target plasma may vary during the course of the operation even though it is necessary to maintain the beta within the range of 0.2 to 10.0 at all times during the operation of fusion devices in the present invention after the initial high beta formation by the use of plasma initiators. The beta may also be chosen within the more preferable ranges of 0.2-5.0, 0.3-3.0, 0.5-2.0, 0.7-1.5, 0.8-1.2, 0.9-1.1 or most preferably, β may be set to be approximately equal to or equal to 1. In addition, the target plasma is to serve as a fusion reaction target for the impinging high energy ion beam to collide with and to generate fusion reactions, where the target plasma temperature is critical for controlling the ion beam energy loss and the efficiency of fusion reactions driven by the injected ion beams. It is noted again that the initial formation of the high beta plasma is achieved by the use of plasma initiators which also control the temperature of the initial high beta plasma. Once high beta plasma is produced by the plasma initiators and the high beta equilibrium is achieved in the magnetic cusp system, the diffusion model of Equation 5 can also be used for the loss of target plasma electrons and ions with the use of their respective gyroradii and particle velocity. Equation 9 and Equation 10 provide the confinement time of electrons and ions of the target plasma at Tp based on the diffusion model.
) / = vwnPion = L96 X 10"10 agT μ; ¾ Tp f2 (i second) (10), where RcUSp is the cusp confinement system radius in cm, Bcusp is the magnetic field strength of the cusp openings in Gauss, Z is the charge of the ions in the target plasma, μιίβ the atomic mass of the ions in the target plasma, and Tp is the temperature of the target plasma in eV in the center of the magnetic cusp system. In the case of deuterium ions, the ion charge, Z, is 1 and the atomic mass is 2. For the ions and the electrons that are in thermal equilibrium and having the same temperature, Equation 9 and Equation 10 show that the confinement time of deuterium ions is shorter than the confinement time of electrons by a factor of (mi/me)° 5 that is square root of the mass ratio between ions and electrons (i.e., -60). As a result, the target plasma will lose more ions than electrons initially, which will result in generation of electric fields, known as ambipolar fields, to equalize the confinement of ions and electrons. The main function of ambipolar fields is to maintain approximately equal number of ions and electrons in the plasma or to satisfy charge neutrality as known in plasma physics. The ambipolar fields will decrease the energy of ions and increase the energy of electrons as they move toward the magnetic sheath from the center. It is noted that the amount of energy change by the ambipolar fields is comparable to the plasma temperature. In this disclosure, we will utilize a geometrical mean model in which the ambipolar fields will increase the ion confinement time to Tambipoiar = y ^ion by reducing target plasma ion energy at the magnetic sheath and decrease the electron confinement time to Tambipoiar = xexion by increasing target plasma electron energy at the magnetic sheath. In the case of deuterium ions in the target plasma, the ambipolar confinement time is 7.7 times shorter than xe from Equation 9 and 7.7 times longer than Xi from Equation 10. It is also noted that the presence of ambipolar fields does not change the confinement property of the ion beam in the target plasma since the ion beam energy is significantly higher than the target plasma temperature and the ambipolar field is too weak to change the ion beam energy significantly. Using the ambipolar confinement time, we will estimate the required fuel injection rate and plasma heating power to sustain the high β plasma in the magnetic cusp as shown in Equation 1 1 and Equation 12. D _ dWstored _ d }(nion+ne)kBTpdV 2navgkBTpV . . .
for a target plasma temperature of 100 eV. In addition, it is also required to provide injection of fuel ions at a rate of 3.7xl021 ions/s or 12 mg/s of deuterium ions from Equation 10. The embodiments of the present invention, as shown in Figure 7, utilizes one or more ion beam injectors 205 and one or more fusion fuel injectors 206 to sustain the high beta equilibrium in the magnetic cusp system after the initial formation of high beta plasma by the use of plasma initiators. As discussed previously, the ion beams will lose their energy to the target plasma as they undergo collisions in the magnetic cusp system. Since the total energy of the system is conserved, the loss of ion beam energy will provide heating of the target plasma. If the input power of the ion beam is sufficiently high, the ion beam injection will maintain the needed plasma temperature in the target plasma without the use of electron injectors. Combined with one or more fusion fuel injectors such as gas jets or cryogenic pellets that supply the fuel ions in the target plasma, ion beam injection can also maintain the needed plasma pressure within the desired range of beta to operate the proposed embodiments of the present invention, thus eliminating the need for the use of electron beam injection. One or more ion beam injectors will be utilized with a combined input power in the range of 0.5 - 30 of the required plasma heating power from Equation 12 or may be chosen within the more preferable ranges of 0.7 - 20, 0.9 - 10, or 1- 5. In addition, one or more fusion fuel injectors will be utilized with a combined fuel injection rate in the range of 0.5 - 30 of the required fuel injection rate from Equation 11 or may be chosen within the more preferable ranges of 0.7 - 20, 0.9 - 10, or 1- 5. In another embodiment of the present invention, plasma heating and fueling is used to sustain a high beta equilibrium in the magnetic cusp system as the magnetic field strength is gradually increased after the initial formation of high beta plasma. For example, the initial high beta plasma may be produced for a cusp magnetic field strength of Bcusp0. By controlling the input power or fuel injection rate or both based on Equation 11 and Equation 12, the high beta equilibrium is maintained with the target plasma beta within the range of 0.2 - 10 while the cusp magnetic field strength is increased from Bcusp0 to Bcuspi. In order to maintain the desired high beta equilibrium in the target plasma during the transition, the change in the magnetic field strength is conducted over a transition time, Transition, that is comparable to or longer than the target plasma confinement time (e.g. ambipolar confinement time). For a magnetic cusp system with a system radius of 50 cm, the required stored energy in the initial high beta plasma at beta = 1 is 19 kJ for a cusp magnetic field strength of 3 kG. For an initial target temperature of 50 eV, this corresponds to an initial target plasma density of 2.2xl015 cm"3. As the cusp magnetic field is gradually increased to 1 Tesla by increasing the electrical currents in the coils, the required stored energy for the high beta plasma will increase to 208 kJ, thus needing increases in target plasma temperature or density or both. For example, if a target temperature is increased from 50 eV to 100 eV, the beta = 1 equilibrium at 1 Tesla corresponds to an increased target plasma density from of 2.2xl015 cm"3 to 1.2xl016 cm"3, as shown in Figure 20. In this case, the required input power to sustain β=1 plasma of 50 eV at 3 kG is 5.5 kW, compared to 15 kW for β=1 plasma of 100 eV at 1 T. By utilizing 15 kW of input power for the ion beam injection, the temperature of the target plasma can be increased from 50 eV to 100 eV while the cusp magnetic field is varied from 3 kG to 1 T. Since the ambipolar confinement time is 13 seconds (from Equations 9 and 10) for a target plasma of 100 eV in a magnetic cusp system with a radius of 50 cm operating at 1 T magnetic field strength, the duration of the transition to utilize the increased magnetic field will be 13 seconds or longer. For steady state operation as envisioned by embodiments of the present invention, the initial delay of 13 seconds to achieve the optimum fusion reactor operation is acceptable for the operation of fusion devices. One of the key benefits of gradually varying the magnetic field strength of the magnetic cusp system is that it reduces the required stored energy for the high beta plasma formation by plasma initiators. As shown above, the required stored energy is only 19 kJ for a beta = 1 equilibrium in a magnetic cusp system with a radius of 50 cm and a magnetic field strength of 3 kG, compared to 208 kJ at 1 T. With the use of weaker magnetic field strength during the initial startup, lower power plasma initiators can be utilized to generate a high beta plasma with less stored energy. By gradually increasing the magnetic field strength while maintaining high beta equilibrium, the target plasma condition can be optimized to generate efficient fusion reactions without needing very high power plasma initiators. It is noted that the slow transition time for varying magnetic field in embodiments of the present invention is different from the adiabatic magnetic compression used in plasma heating. In the adiabatic magnetic compression, the rate of magnetic field change has to be slow compared to the plasma response time but fast compared to the plasma confinement time to provide plasma heating. As such, a typical duration of adiabatic magnetic compression for plasma heating by increasing magnetic field strength is between 10 and 10 ms, much shorter than the plasma confinement time. While the self-generated ambipolar field in the target plasma is beneficial to reduce the loss of ions from the high beta plasma, we disclose another method to further reduce the ion loss. By injecting low energy electrons into the high beta magnetic cusp system, it is possible to increase the total number of electrons above the total number of ions in the plasma. The resulting net negative charge of the plasma will produce an electrostatic potential well in the magnetic cusp system. Similar to the ambipolar fields, this externally driven electrostatic potential well slows down ions as they approach the magnetic sheath and decreases the ion velocity and the gyroradius accordingly, which will result in increased ion confinement time. Equation 13 and Equation 14 are the modifications of Equation 9 and Equation 10 in the presence of a potential well with a potential well depth of φ.
where xe we11 is the confinement time of the electrons in the presence of the potential well, Xiwe11 is the confinement time of the ions in the presence of the potential well, RcUSp is the cusp confinement system radius in cm, Bcusp is the magnetic field strength of the cusp openings in Gauss, Z is the charge of the ions in the target plasma, the atomic mass of the ions in the target plasma, and Tp is the temperature of the target plasma in eV in the center of the magnetic cusp system, and φ is the potential well depth in eV. If a potential well depth becomes comparable to the plasma temperature, the ion confinement time can be increased significantly compared to the case without a potential well as shown in Equation 14. It is however noted that Equation 14 becomes invalid if the potential well depth becomes larger than the target plasma temperature. In that case, the outward motions of ions are strongly constricted by the potential well and ions do not reach the magnetic sheath before turning back to the center by the potential well. This results in a reduced target plasma size for the ion beam induced fusion reactions. In addition, the confinement time of the electrons will decrease with the increase in the potential well depth since the electrons will gain energy as they move outward to the magnetic sheath. As a result, it is in practice advantageous to control the potential well depth to be nearly equal to the target plasma temperature. Specifically, embodiments of the present invention utilizes low energy electron beam injection to produce an electrostatic potential well in the high beta target plasma with a resulting potential well depth in the range of 0.8 and 2 times the target plasma temperature; it may however be chosen within the more preferable ranges of 0.9 - 1.5 or 0.95 - 1.2. It is noted that the potential well depth is proportional to the electron beam energy with a typical ratio between the potential well depth to the electron beam energy of 0.5 - 1. Consequently, embodiments of the present invention utilizes the low energy electron beam injection to produce a negative potential well with the electron beam energy in the range of 0.8 and 4 times the plasma temperature or may be chosen within the more preferable ranges of 1 - 3, or 1.2 - 2. Furthermore, embodiments of the present invention utilizing energy electron beam injection will operate with the target plasma temperatures between 20 eV and 5 keV or more preferably in a range selected from one of 20-200 eV, 40- 400 eV, 100 eV- 1 keV, and 300 eV - 2 keV and 1 keV-5 keV. In addition, the low energy electron injectors need to replace the lost electrons from the magnetic cusp system in order to maintain the net negative charge in the high beta target plasma. Equation 15 provides the estimate for the required injection current for the low energy electrons. Te we11 is given by Equation 13. With the ion loss rate reduced by the potential well, the potential well will disappear if lost electrons from the magnetic cusp system are not continuously replaced by the electron injectors. For example, for a magnetic cusp system at β=1 equilibrium with a cusp system radius of 50 cm and the cusp magnetic field of IT, the required electron injection current is 19A to generate and sustain an electrostatic potential well of 90 V for a target plasma temperature of 190 eV. If the electron beam energy of 100 eV is utilized, this current corresponds to the electron beam power of 1.9 kW, much lower than the required electron beam current of 210 A and the input power of 2.1 MW to produce an electrostatic potential well on the order of 10 kV with the use of electron beam energy of 10 keV. The apparatus in Figure 21 is another embodiment of the present invention. It comprises a vacuum enclosure 201 (reactor chamber), coils generating cusp magnetic fields 202, one or more plasma initiators 203 to form high β plasma 204 during the startup, one or more ion beam injectors 205 to produce fusion reactions and to provide heating to the target plasma, and a fusion fuel injection system 206 to replenish ions and electrons in the target plasma, and one or more low energy electron beam injectors 721 to form a potential well to reduce the ion loss of the target plasma. The one or more low energy electron beam injectors 721 operate with an electron beam energy in the range of 0.8 and 4 times the target plasma temperature or may be chosen within the more preferable ranges of 1 - 3, or 1.2 - 2 times the target plasma temperature where the target plasma temperatures are between 20 eV and 5 keV or more preferably in a range selected from one of 20-200 eV, 40- 400 eV, 100 eV- 1 keV, and 300 eV - 2 keV, and 1 keV-5 keV. In addition, the one or more low energy electron beam injectors 721 operate with the electron injection current in the range of 0.8 and 4 times the required electron beam current from Equation 15 or may be chosen within the more preferable ranges of 1 - 3, or 1.2 - 2 times the required electron beam current. The vacuum condition in the device is maintained by one or more pumping ports 207, a gas valve system 208, and vacuum pump system 209. Each coil system 202 is supported by a mechanical support structure 210, which includes a power delivery and cooling system 211. It is noted that this embodiment of the present invention is different from the neutron generator by Park et al. where the electron injection is utilized to heat the plasma without producing an electrostatic well, which limits the maximum electron injection current below the required electron injection current shown in Equation 15 In addition, the neutron generator previously disclosed by Park et al utilizes high energy electron beams above 10 keV to provide plasma heating compared to the use of low energy electron beams in the range of 20 eV and 5 keV in embodiments of the present invention. Based on the various embodiments discussed above, here we provide a number of examples showing how the present invention can be utilized for neutron generation, medical isotope production, and transmutation of nuclear wastes. The first example is a neutron generator for fusion neutron applications including aerospace industry neutron radiography and explosive and illicit nuclear material detection for security applications. In these applications, the desirable neutron flux is between 5xl0u neutrons/s and lxlO13 neutrons/s. Assuming the use of D-T fusion reactions, it is then possible to produce a neutron flux of 5.7xl013 neutrons/s with an input power of 10 kW supplied by the ion beam injector in a compact fusion device based on the present invention. Table 1 provides the expected specification of a device based on the present invention. In comparison, an existing state-of-the art gas target fusion neutron generator produces a neutron flux of 1 to 5xl013 n/s using an ion beam power of 15 kW in a system size on the order of 3 meters weighing approximately 2,000 kG . Its compact system size and higher fusion neutron generation efficiency make the present invention economically attractive. 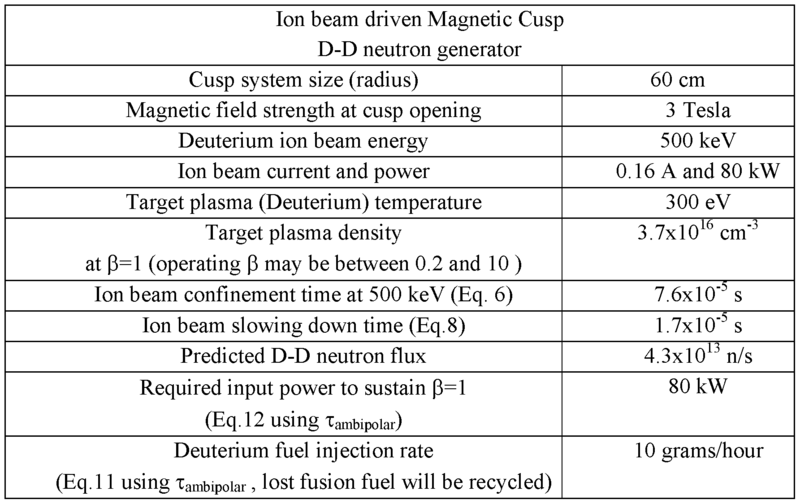 Table 1 Estimated system specification for an ion beam driven magnetic cusp D-T fusion neutron generator. Fusion neutrons can also be utilized for medical isotope generation such as the production of Molybdenum 99 isotopes or for medical cancer treatments of brain cancers and other difficult to treat cancers based on boron-neutron capture therapy. 14 MeV neutrons from D-T fusion reaction can also be utilized for transmutation of long-lived transuranic (TRU) wastes generated by the conventional nuclear fission reactors. In these applications, significantly higher neutron fluxes are needed, on the order of lxlO15 n/s and lxlO17 n/s or more. Table 2 provides the expected specification of a D-T fusion reactor capable of producing 4.2xl016 n/s with an input power of 225 kW supplied by the ion beam injectors based on the present invention. In addition to the increase in system size and magnetic field strength, it is also important to increase the temperature of the target plasma to reduce the ion beam slowing down. Further increases in fusion neutron flux can be achieved by increasing the system size, increasing the magnetic field strength or increasing the target plasma temperature. 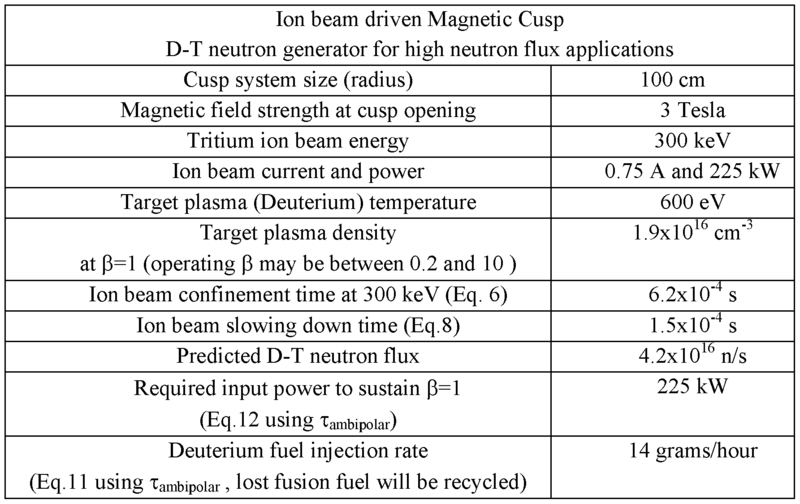 Table 2 Estimated system specification for an ion beam driven magnetic cusp D-T fusion neutron generator for high neutron flux applications. It is also possible to utilize the present invention to produce a significant neutron flux using D- D fuel. Table 3 provides the expected specification of such a device based on the present invention. Compared to D-T fuel, significant increases are needed for ion beam injection energy, system size, and magnetic field strength due to lower fusion reactivity of D-D fuel. Table 3 provides the expected specification of a D-D fusion reactor capable of producing 2.3xl013 n/s with an input power of 80 kW supplied by the ion beam injectors based on the present invention. Despite its bigger size and higher input power, a D-D neutron generator does not use radioactive tritium fuel which simplifies the system engineering requirements for safely handling radioactive materials and the associated regulatory approval process. 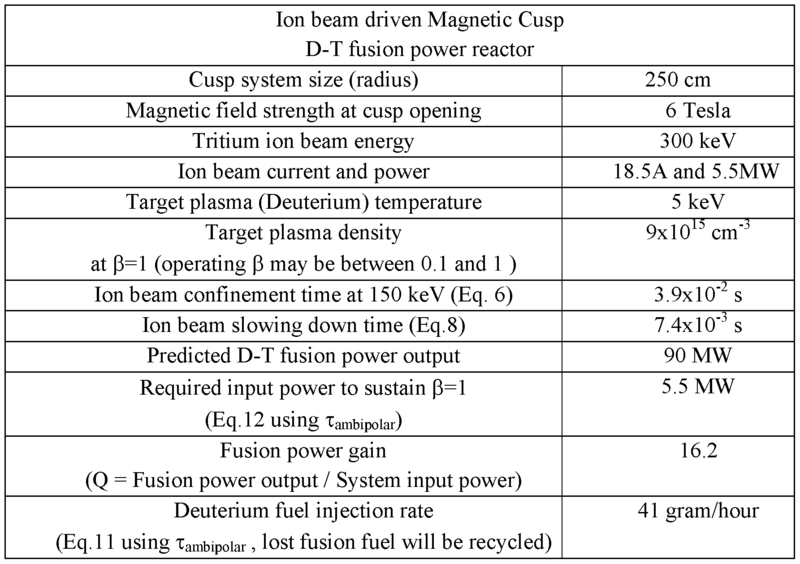 Table 3 Estimated system specification for an ion beam driven magnetic cusp D-D fusion neutron generator. Another example of the present invention is a compact and highly efficient fusion reactor producing high energy 14.7 MeV protons from D - 3He fusion reactions. High energy protons above 10 MeV can induce nuclear reactions to produce many useful medical isotopes such as Oxygen-15 and Fluroine-18 for Positron Emission Tomography (PET) scans. At present, most PET isotopes are produced with the use of high energy protons from cyclotron accelerators. These cyclotron accelerators are large, heavy and costly. If D-3He fusion reactions are utilized, the present invention can produce 14.7 MeV protons from 300-500 keV of deuterium or helium-3 ion beams where the ion acceleration is achieved using electrical grids. Table 4 provides the expected specification of a D-3He fusion reactor capable of producing 4.5 μΑ of 14.7 MeV proton beam current for PET isotope production based on the present invention. In this case, in order to further minimize the input power, low energy electron beam injection with a beam energy of 300 eV or 1.3 times the target plasma temperature is utilized to suppress the ion loss from the target plasma with a potential well of 215 V. It is noted that the embodiment shown in Figure 18 will be utilized to control the exhaust of fusion protons to a specific cusp opening for the PET isotope generation. The present invention can achieve significant cost savings for high energy proton acceleration due to its small size, modest system input power and the use of DC electrical systems compared to conventional cyclotron accelerators. 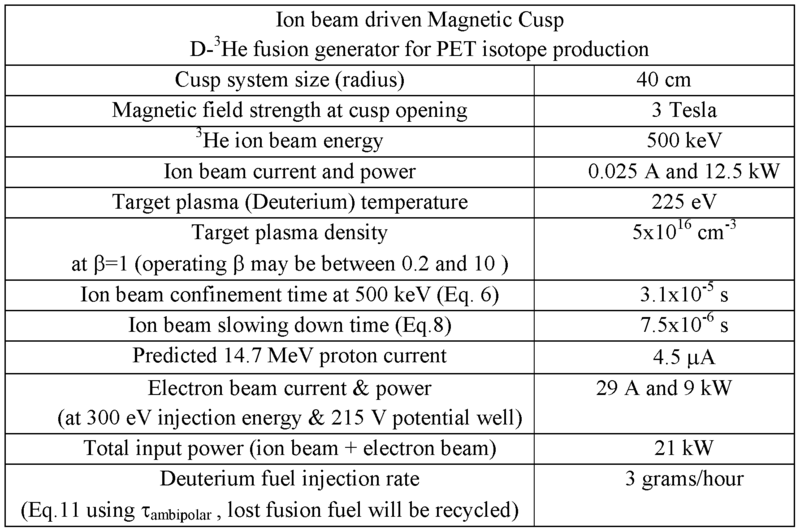 Table 4 Estimated system specification for an ion beam driven magnetic cusp D-3HE fusion proton generator combined with the low energy electron beam injection for PET isotope production. Finally, it is also feasible to utilize one of the preferred embodiments to construct a fusion power reactor that can generate comparable or more fusion output power than input power to sustain the plasma. The ion beam driven fusion power reactor can be utilized as a stand-alone fusion power system or as a part of fusion -fission hybrid power system. Table 5 provides the expected specification of a D-T fusion power reactor capable of producing more fusion power output than input power to sustain the plasma. This particular embodiment does not utilize the electron beam injection to produce a potential well. Instead, it relies on ion beam heating to sustain the target plasma while producing sufficient fusion power output. It is noted that 3.5 MeV helium ions can also deposit significant energy in the magnetic cusp system. From Eq. 3 and Eq. 4, the estimated confinement time for 3.5 MeV helium ions from D-T fusion reactions is 3.4 ms, while their slowing down time is 1.4 ms in the fusion reactor as specified in table 5. As such, a significant amount of fusion power can be utilized to sustain the high β target plasma and to reduce the minimum ion beam power required in the embodiment. Since this particular embodiment does not require an electrostatic potential well formation using high energy electron beams, it offers an alternative to fusion power reactors disclosed by Park et al , while still utilizing plasma initiators to produce high β plasma during the start-up. 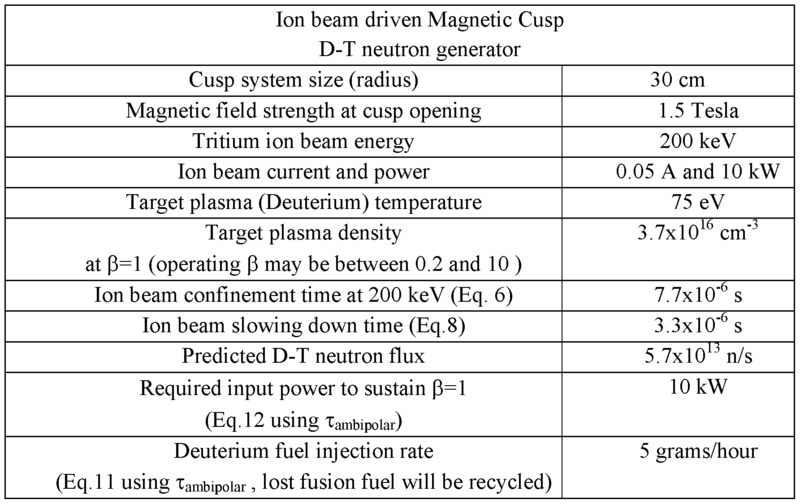 Table 5 Estimated system specification for an ion beam driven magnetic cusp D-T fusion neutron generator. These examples highlight the technical and economic improvements in generating fusion reactions from the present invention. While the foregoing has been made with reference to a particular embodiment of the invention, it will be appreciated by those skilled in the art that changes in a particular embodiment may be made without departing from the principles and spirit of the disclosure, the scope of which is defined by the appended claims. The following references provide more background of some of the conventional techniques in the art. Each of these references is incorporated by reference in its entirety for all purposes. 1. Najamabaid, R and Conn, R. W., and The ARIES Team," The ARIES-III Tokamak Fusion Reactor Study - The Final Report", UCAL report UCLA-PPG-1384 (1992). 2. McGuire, T. J., "Magnetic Field Plasma Confinement for Compact Fusion Power ", US patent application US20140301518A1 (2014). 3. Enomoto, Y., et al., "Synthesis of Cold Antihydrogen in a Cusp Trap", Physical Review Letter Volume 105, 243401 (2010). 4. Bussard, R.W., "Method and Apparatus for Controlling Charged Particles", US Patent 4,826,646 (1989). 6. Berkwoitz, J, et al., "Cusped Geometries", Proceeding of Second U.N. International Conference on Peaceful Uses of Atomic Energy, Geneva, Volume 31, pl71-pl76, (1958). 7. Park, J. et al., "High-Energy Electron Confinement in a Magnetic Cusp Configuration", Physical Review X Volume 5, 021024 (2015). 9. HUB A, J.D., "NRL Plasma Formulary," Beam Physics Branch, Plasma Physics Division, Naval Research Laboratory, Washington, DC, 71 pages (2013). 9. Marshall, Jr., J, "Methods and Means for Obtaining Hydro-magnetically Accelerated Plasma Jet", US Patent 2,961,559 (1960). 10. R. E. Pechacek, J. R. Greig, M. Raleigh, D. K. Koopman, and A. W. DeSilva, "Measurement of the Plasma Width in a Ring Cusp", Physical Review Letters, Volume 45, p 256-p 259 (1980). 11. Phoenix Nuclear Labs, "The World's Strongest Commercial Neutron Generators", http : //phoenixnucl earl ab s .com/ product/hi gh-yi el d-neutron-generator/ (2017). wherein the ion beam provides ions for producing fusion reactions and heating the target plasma to sustain the high beta target plasma in the magnetic cusp system. wherein the plasma initiator produces the high beta target plasma inside the reaction chamber; and wherein the ion beam provides ions for producing fusion reactions and heating the target plasma to sustain the high beta target plasma in the magnetic cusp system. wherein 1) the one or more ion beam injectors, by controlling the power of the one or more ion beam injections, or 2) the one or more fusion fuel injectors, by controlling the fuel injection rate of fusion fuel or both 1) and 2), being operative to raise the high beta target plasma to an operating temperature to Tpl, where Tpi is greater than Tp0 while maintaining the target plasma beta within the range of 0.2 - 10.
wherein the one or more plasma initiators produce the high beta target plasma equilibrium inside the reaction chamber with beta within the range of 0.2-10 for a cusp magnetic field strength of Bcuspo; wherein currents in the coils of the coil system are increased so as to increase the magnetic field within the reaction chamber from Bcusp0 to Bcuspi, where Bcuspi is greater than Bcusp0; and wherein 1) the one or more ion beam injectors or 2) one or more fusion fuel injectors or both 1) and 2) are adjusted to increase the target plasma pressure to maintain the target plasma beta within the range of 0.2 - 10 as the magnetic field is increased from Bcusp0 to Bcuspi. wherein the one or more electron injectors inject a net negative charge in the high beta target plasma and replenishing lost electrons from the confined plasma. 2. The apparatus of claim 1, wherein the coils are inside of the chamber. 3. The apparatus of claim 1, wherein the coils are outside of the chamber. 4. The apparatus of any one of claims 1-3, wherein the system of cusp magnetic fields includes magnetic cusp openings. 5. The apparatus of claim 4 the reaction chamber has sufficient clearance from a magnetic sheath and the cusp openings so as not to intercept the plasma and ion beam motion in the high beta target plasma. 6. The apparatus of any one of claims 1-5, wherein the high beta target plasma has a beta in the range of 0.2-10. 7. The apparatus of any one of claims 1-6, wherein the coil system has at least one exhaust coil having a weaker magnetic field as compared to the cusp coils to preferentially exhaust fusion products from the high beta target plasma. 8. The apparatus of claim 7, wherein the coil system has one or more collimating coils for collimating and directing the exhausted fusion products from the high beta target plasma to a material target system configured to utilize the fusion products to generate nuclear reactions. 9. The apparatus of any one of claims 1-8, wherein the high beta target plasma has a beta equal to βο inside the reaction chamber with an initial plasma temperature Tp0 between 5 eV and 200 eV and wherein 1) the one or more ion beam injectors, by controlling the power of the one or more ion beam injections, or 2) the one or more fusion fuel injectors, by controlling the fuel injection rate of fusion fuel or both 1) and 2), being operative to raise the high beta target plasma to an operating temperature to Tpl, where Tpl is greater than TpO while maintaining the target plasma beta within the range of 0.2 - 10. 10. The apparatus of any one of claims 1-9, wherein the one or more plasma initiators produce the high beta target plasma equilibrium inside the reaction chamber with beta within the range of 0.2-10 for a cusp magnetic field strength of Bcusp0 between 0.05T and 0.5T and wherein currents in the coils of the coil system are increased so as to increase the magnetic field within the reaction chamber from Bcusp0 to Bcuspi, where Bcuspi is greater than Bcusp0 and wherein 1) the one or more ion beam injectors or 2) one or more fusion fuel injectors or both 1) and 2) are adjusted to increase the target plasma pressure to maintain the target plasma beta within the range of 0.2 - 10 as the magnetic field is increased from Bcusp0 to Bcuspi. at a reaction chamber having a coil system with coils, one or more plasma initiators, one or more ion beam injectors, one or more fusion fuel injectors: generating a system of cusp magnetic fields within the reaction chamber with the coil system; generating a high beta target plasma within the reaction chamber with the one or more plasma initiators; providing ions, using the one or more ion beam injectors, for producing fusion reactions and heating the target plasma to sustain the high beat target plasma in the magnetic cusp system; and supplying neutral molecules of fusion fuel into the system of magnetic cusp fields for replenishing lost ions and electronics and ions consumed by nuclear fusion reaction. 13. The method of claim 12, wherein the coils are inside of the chamber. 14. The method of claim 12, wherein the coils are outside of the chamber. 15. The method of any one of claims 12-14, wherein the system of cusp magnetic fields includes magnetic cusp openings. 16. The method of claim 15, wherein the reaction chamber has sufficient clearance from a magnetic sheath and the cusp openings so as not to intercept the plasma and ion beam motion in the high beta target plasma. 17. The method of any one of claims 12-16, wherein the high beta target plasma has a beta in the range of 0.2-10. 18. The method of any one of claims 12-17, wherein the coil system has at least one exhaust coil having a weaker magnetic field as compared to the cusp coils to preferentially exhaust fusion products from the high beta target plasma. collimating and directing, using collimating coils of the coil system, the exhausted fusion products from the high beta target plasma to a material target system configured to utilize the fusion products to generate nuclear reactions. 20. The method of any one of claims 12-19, wherein the high beta target plasma has a beta equal to βο inside the reaction chamber with an initial plasma temperature Tp0 between 5 eV and 200 eV and wherein 1) the one or more ion beam injectors, by controlling the power of the one or more ion beam injections, or 2) the one or more fusion fuel injectors, by controlling the fuel injection rate of fusion fuel or both 1) and 2), being operative to raise the high beta target plasma to an operating temperature to Tpl, where Tpl is greater than TpO while maintaining the target plasma beta within the range of 0.2 - 10.
producing, using the plasma initiators, the high beta target plasma equilibrium inside the reaction chamber with beta within the range of 0.2-10 for a cusp magnetic field strength of Bcusp0 between 0.05T and 0.5T and wherein currents in the coils of the coil system are increased so as to increase the magnetic field within the reaction chamber from Bcusp0 to Bcuspi, where Bcuspi is greater than Bcuspo and wherein 1) the one or more ion beam injectors or 2) one or more fusion fuel injectors or both 1) and 2) are adjusted to increase the target plasma pressure to maintain the target plasma beta within the range of 0.2 - 10 as the magnetic field is increased from Bcusp0 to Bcuspi.